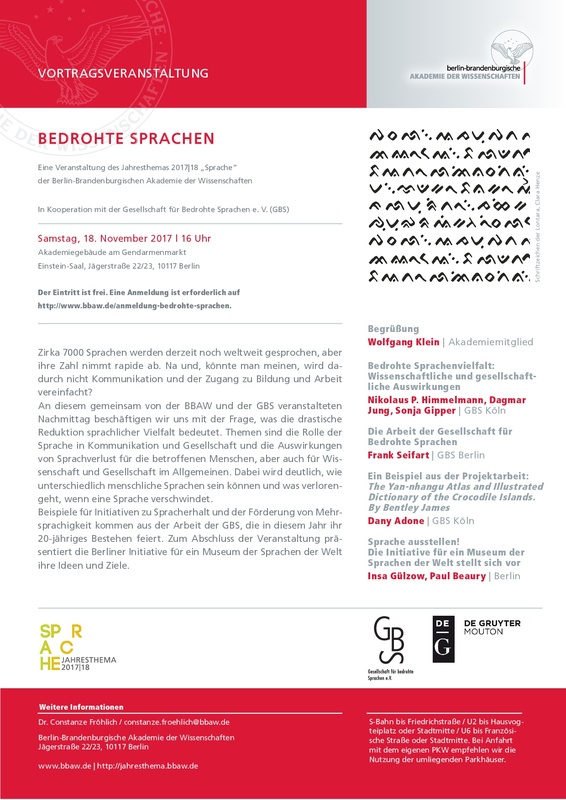 The Society for Endangered Langages (Gesellschaft für bedrohte Sprachen, GBS) organises a joint event in collaboration with the Berlin-Brandenburg Academy of Sciences and Humanities (Berlin-Brandenburgische Akademie der Wissenschaften). This event focuses on endangered languages and will feature a presentation of CAS-members Dr. Bentley James and Prof. Dr. Dany Adone on the Yan-nhangu Atlas Project. Please register for the event at: http://www.bbaw.de/anmeldung-bedrohte-sprachen.